(with flax seed, chocolate chips, pecans and raisins)! 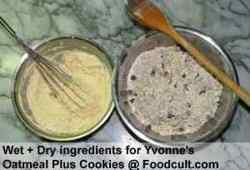 Now let's go make a batch of Yvonne's Oatmeal Plus Cookies! In the first bowl (or in the bowl of an electric mixer, beat fat (butter or margarine) together with the sugar until it is fluffy. Add lightly beaten egg and 1/2 tsp vanilla and beat until smooth and set aside for later use. In the second bowl, combine 1 2/3 C whole, large flake oats, 3/4 C all purpose flour, 1/2 tsp baking soda, 1 1/4 tsp salt and 1 1/4 tsp cinnamon and stir this until all ingredients are well blended. Add 1/3 c each of nuts, raisins and chocolate chips and stir until blended. Combine the wet and dry ingredients in the larger bowl and stir the contents until all ingredients are fully incorporated into each other. Bake until golden brown (9 to 13 minutes). 11 minutes makes a nice, almost chewy cookie. Try them between, about 10 to 13 minutes. 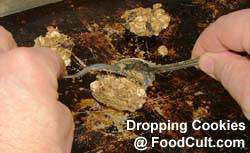 It is recommended that you leave a cookie on the sheet just long enough for the bottom to set ... and this is smart but with these cookies, we like to free them from the pan as soon as possible to maintain a little bit of a chewy texture ... but Yvonne's Oatmeal Plus Cookies are great both ways - chewy and crunchy! A cookie is a cookie is a cookie ... until, that is, it's Yvonne's Oatmeal Plus cookie. So what's the "Plus"? This is a kind of "everything" cookie rich with flax seeds, chocolate chips, pecans and raisins. Cookies are almost never health food and this is not much different except that it does provide some positive food value. It's rich in two of Yvonne's favourite grains - oat and flax. Oat is a fibre winner rich in insoluble and soluble fibres. Every 1/3 cup of oat grains feature 1 gram of soluble fibre and 2 grams of insoluble fibre. We bump that important soluble fibre content in these cookies with a full 1/3 cup of freshly milled flax seed. 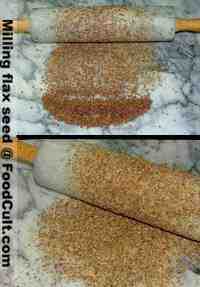 Even better, flax is a known source of omega fatty acids. These are win-win-win ingredients. The cookie is topped up with semi-sweet chocolate chips, pecan pieces and all-natural, additive free raisins. We use organic cane sugar. This takes a bit longer to dissolve but it makes a very nice cookie. Since this sugar product already has some molasses in it and since we want, in this case, a slightly lighter coloured cookie, we use only organic cane sugar. We have made this recipe with butter and with margarine. Butter makes a slightly flakier cookie. They're wonderful both ways! Visit WallpaperOriginals.com to get cookies for your desktop!